This article provides details on managing domains within your Account Center. If you are looking for domain registration information, including managing WHOIS info, please click here. The following instructions will show you how to add a domain to any of your Media Temple servers. For detailed instructions with screen shots, please see: How do I add a domain or subdomain to my server? 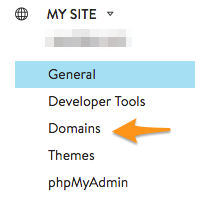 From within your Account Center, hover over the Domains tab and click on Add New Domain or Service. Type in your domain name. Be sure not to use any of the following subdomains: www, ftp, or email. If you are trying to register a new domain, choose I want to register this domain. Additional details are here: How do I register a new domain? Select I already own this domain if you are adding a domain you have already registered. If you're adding a subdomain, you will see a warning box. Please read the message and click the check box to proceed. Now select your server of choice, then click on Next Step. You should now be on the Overview page of the Account Center, and see your domain listed under the server you previously selected. The following instructions will show you how to remove a domain. Please remember removing a domain will stop all services such as mail and FTP for that domain. We encourage you to backup all data for a domain before you decide to remove a domain from your account. From the Overview page in your Account Center, click directly on the domain you wish to remove. 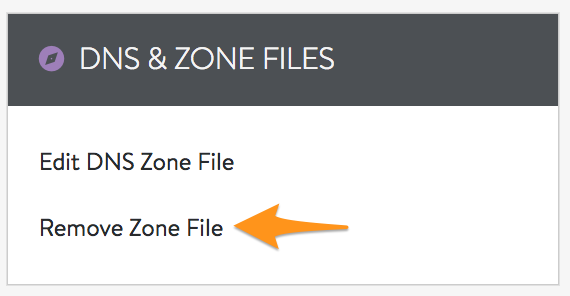 Under the section labeled Domain Tools, click on Remove Zone File. A page will be displayed warning you that all the services such as mail and ftp will stop for the domain you are about to remove. If you are removing the domain from a Grid, be sure to check the box for Remove the alternate domain entry also. However, keep in mind that removing the alternate domain entry will will delete any email users and inboxes, as well as other data associated with the alternate domain in question. Click on the Remove Zone button to confirm. You should no longer see the domain listed on your Overview page or domains tab. In some cases due to browser cookie sessions, you may have to log out of the Account Center, then log back in to see the list updated. 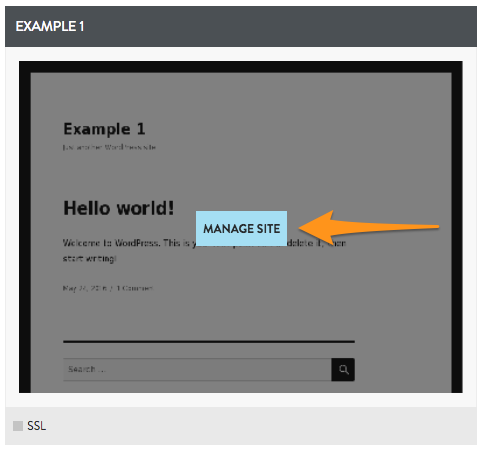 Use these instructions to remove a domain for your Managed WordPress service. Click on the Manage button to the right of the domain that you'd like to remove. 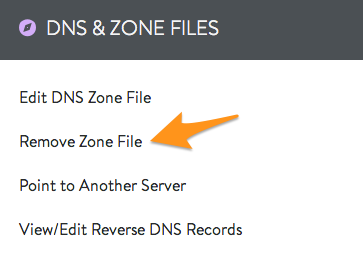 Select Remove Domain from the DNS & ZONE FILES panel. Confirm that you'd like to remove the zone file. Will removing the domain close the domain registration for that domain? No, removing a domain will not close the domain registration service. If you wish to close registration for a domain, you can do so from the billing page within the Account Center. Will removing the domain from the Account Center remove all of the domain's files? 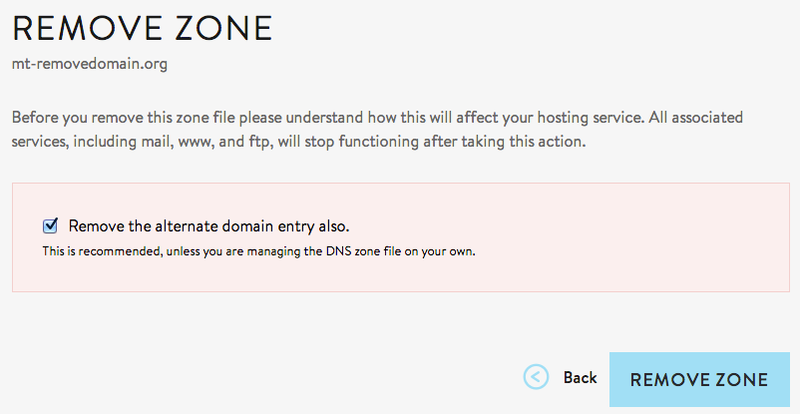 No, removing a domain from the Account Center simply affects the domain's DNS. All of the files for that domain will still exist. However, if you are removing the domain from a Grid, then any users associated to that domain may be removed, including any data (such as email) associated with those users. Currently, all of our servers allow you to change the primary domain. For DV and Dedicated Servers, this will also set the hostname. For detailed instructions on how to change your primary domain, click here. Below we offer guides on the various ways to transfer or move a domain. How do I transfer a domain to a server on another (mt) account? If the domain is registered with us, we suggest you transfer the domain registration service for that domain as well.